Too bad noone listened to Michael Moore about building Auto World. 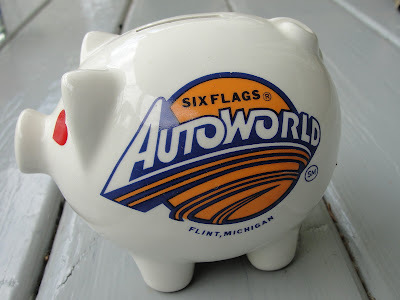 Just thinking out loud, but I wonder if Autoworld would work today if we could bring it back and better market it using modern technology. I don't think it could have worked as an indoor amusement park. There haven't been many entirely indoor amusement parks that have done well, particularly in locations that aren't otherwise an alaready-recognized entertainment destination. Recall that not long before the AutoWorld period, a well promoted, well funded indoor amusement park in downtown Atlanta, in an area with many other attractions and a lot of teenaged weekend/evening entertainment traffic, failed because it tried to be "amusing" to kids and their parents, and those customers didn't want to mix with the teenagers. AutoWorld had that problem in addition to its others...the planners hadn't decided who to appeal to, and whether that customer group would come to that location. One of the original concepts for AutoWorld was to be a full-tilt car museum and car show, providing a facility for the Sloan collection and public viewing of various private collections; providing a space for themed car shows; and utilizing its external parking as a "home base" for summertime cruises. Thus it would have been much more directly auto themed year-round, not unlike the Auburn/Duesenburg/Cord and Studebaker museums in Indiana. The dome space, when not scheduled for car shows or other IMA-type events i.e. graduations, etc., could have been marketed as a regional event facility much like the commercial facility in Novi. That same idea was seriously considered as a "re-boot" approach after the amusement park failed. Bill White actually hired a fairly high powered facility promoter with that latter thought in mind, before changing his mind a month later and deciding to tear the building down and give the property and a bunch of expansion money to U of M.
Almost no one in Flint believed AutoWorld would work. Michael Moore was far from alone. Too far off the beaten path, like a major east west Interstate like the Ohio Turnpike. Another thread discusses whether a name change for Flint would help. Well, will Sandusky, Ohio have to change it's name now that people may associate it with Jerry Sandusky? Will Cedar Point suffer without such a name change? > Almost no one in Flint believed AutoWorld would work. I think that's revisionist. I'd put public sentiment even three months after the opening at more like 50:50. During AutoWorld's planning, there was a lot of optimism. It was much less clear that Flint's troubles were systemic, and of course the general populace didn't yet realize that the "amusement park" wouldn't be much fun, the food concessions would be too expensive to operate at low load factors, the museum would be allocated too little space either to tell Flint's real historical story or to present Sloan's full auto collection, the Imax theater would be economically crippled by not having its own outside entrance, and so forth. Some folks, of course...Michael Moore in particular... *wanted* Flint to crash and burn, to validate their socioeconomic world-view and aggrandize themselves as seers of the future. That didn't help. I think there are a lot of folks too attached to the notion of a "downtown", mainly for nostalgia. Cheesy though it may be, we're a car & mall society now. I wish someone had put Autoworld at the other end of the Huckleberry railroad, and connected it with Crossroads village. Sort of a vist the 19'th and 20'th centuries in one trip deal.